I have always thought that Great Blue Herons (Ardea herodias) look a bit awkward on the ground, tall and gangly, but they are exceptionally beautiful in the air. 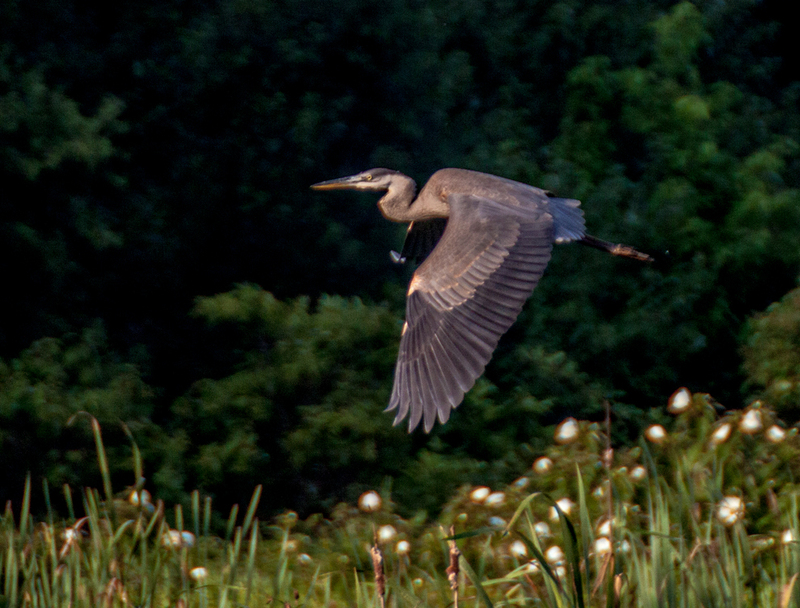 As I approached this blue heron yesterday at my local marshland park, it decided to take off. I often try to capture photos of birds in flight, though generally I’ve had only limited success. I was pretty happy with this shot, taken shortly after the heron had taken to the air. The shaded woods make a decent backdrop and I like the blooming mallow flowers in the foreground. The focusing is a little soft, but I was able to capture some of the magnificent details of the visible wing. Can you spot the heron in this photo? I think that you probably can pick out the Green Heron (Butorides virescens), which blends in pretty well with the vegetation, a little easier than I was able to do, when I visited my local marshland yesterday. The heron, which I think might be a young one, was foraging about in the marsh plants, unlike other Green Herons that I have seen in the past, which tended to stand near the edge of the water awaiting prey. If the heron had not moved, I might not have seen him, because it was so close to the ground. 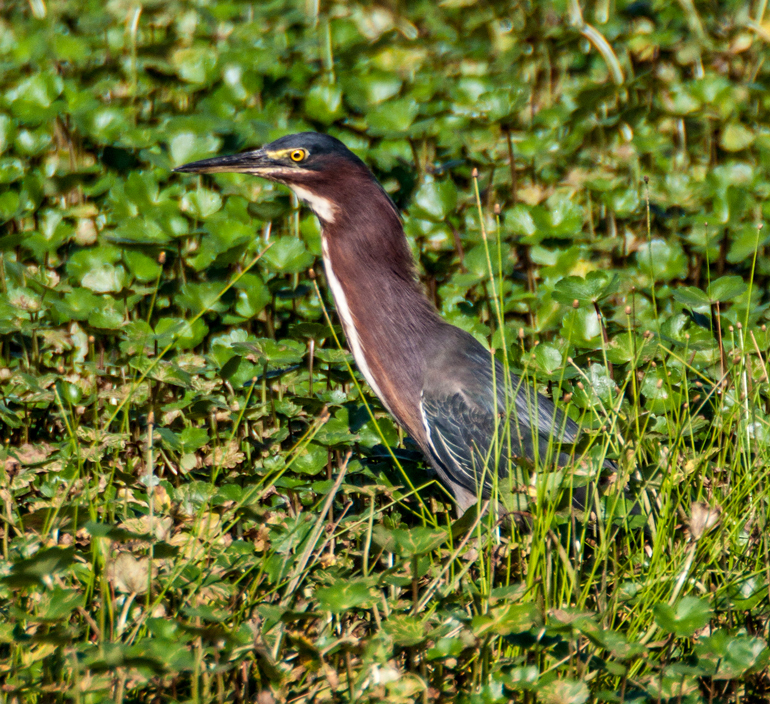 I really like the colors of the Green Heron and its distinctive yellow eyes. The Green Heron may not be as big in size as a Great Blue Heron, but it has its own beauty—maybe I should begin a campaign to change its name to Great Green Heron. As the beautiful afternoon light illuminated the wings of this Eastern Tiger Swallowtail butterfly (Papilio glaucus) from behind, I couldn’t help but think of a stained glass window. 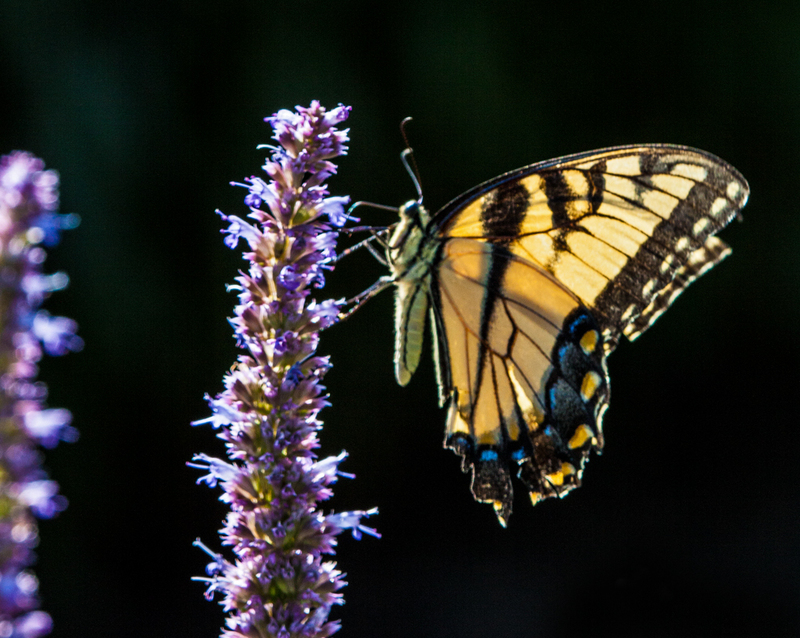 I love backlighting and these subjects seemed perfect to showcase the effect—I didn’t even have to worry about using fill flash to avoid shadows, because of the translucency of the wings. I took this image yesterday at Meadowlark Botanical Gardens in Vienna, Virginia, yet another wonderful local spot for photographing flowers and insects. I never fail to be excited by the sight of a large, powerful bird soaring through the air. Earlier this month, as I was walking along Cameron Run, a tributary of the Potomac River, I spotted a bird heading right toward me. 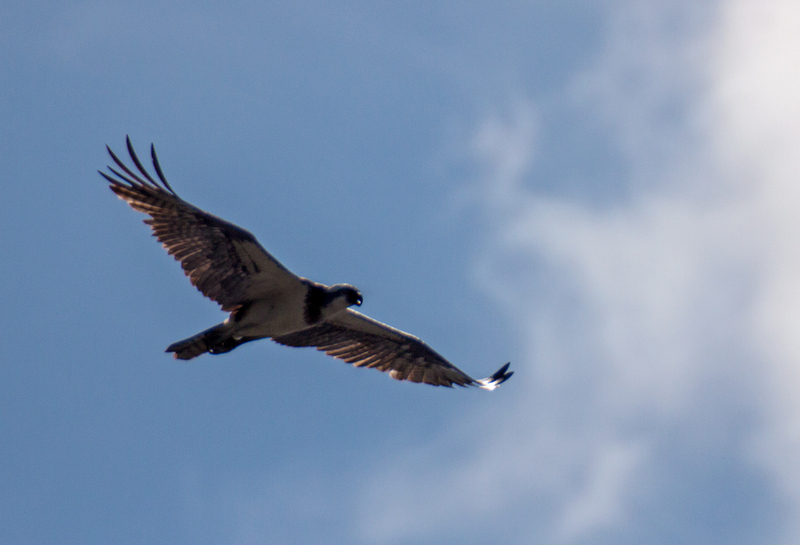 It kept getting bigger and bigger as it approached and I suspected it was a hawk or an eagle—it turned out to be an osprey. Fortunately I had my largest telephoto zoom lens, a Sigma 135-400mm, already on my camera and, after a few adjustments, I started snapping away. 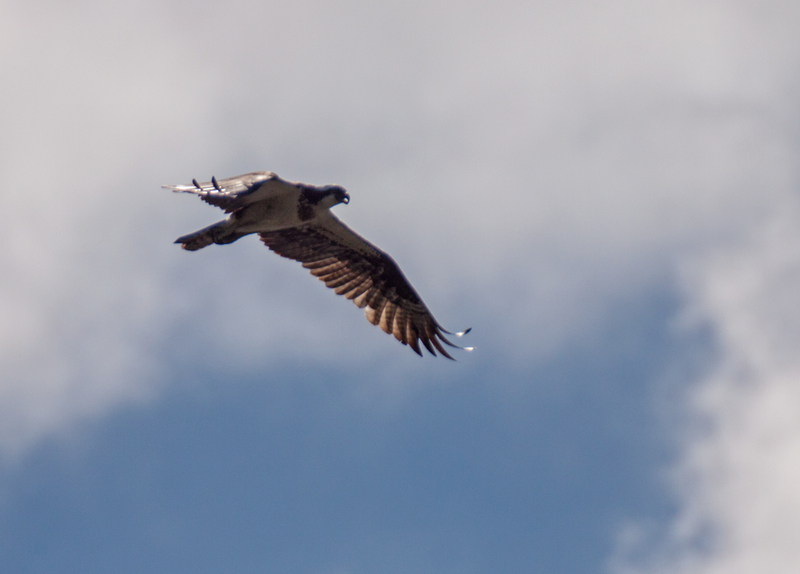 I was shooting almost directly into the sun, so much of the detail of the osprey’s body are hidden in the shadows, but I was able to capture some of the details of its amazing wings, with a little backlighting. Click on the images to see a higher resolution view of some of these details. It may seem that I am photographing insects and spiders these days, judging from my blog postings, but I continue to enjoy photographing birds. In fact, photographing birds in flight is one of the specific areas in which I hope to improve, so these photos may be a preview of coming attractions once summer is over. 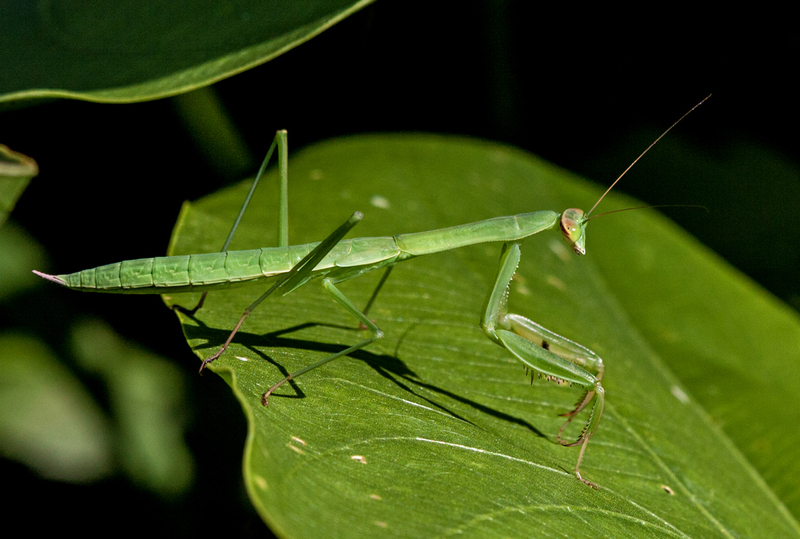 Praying mantises blend in so well with their surroundings that it is extremely rare for me to see one. This past weekend I spotted one as I was scanning the undergrowth while I was walking along the boardwalk in my local marsh. The challenge for me was to figure out how to get a good shot of the praying mantis, which was sitting among some green leaves just about level with the boardwalk itself. 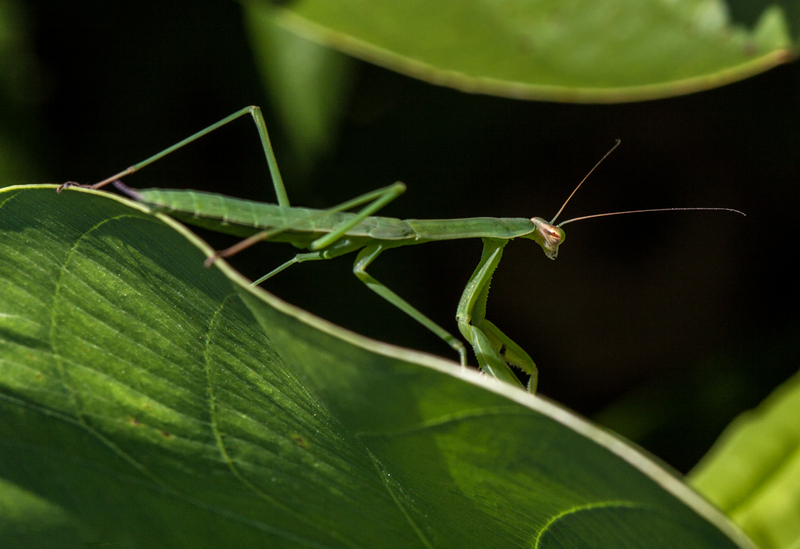 I first tried shooting from directly above the insect, but I didn’t like the results very much, because I could not seem to make the praying mantis stand out from the background. The second basic approach that I tried was to shoot at eye level with the insect. This produced some good results, like the second photo below, because I was able to capture a lot of details of the mantis and the shadows add interest to the shot. I got my favorite image, the first one, when I shot from below the level of the insect, by hanging over the edge of the boardwalk. Framing the shot was a bit tricky because I had to place myself in the middle of the vegetation without disturbing the praying mantis (you should never disturb an insect when it is praying). I also had to shoot from an awkward angle in which it was difficult to steady the camera, so many of my shots were blurry. 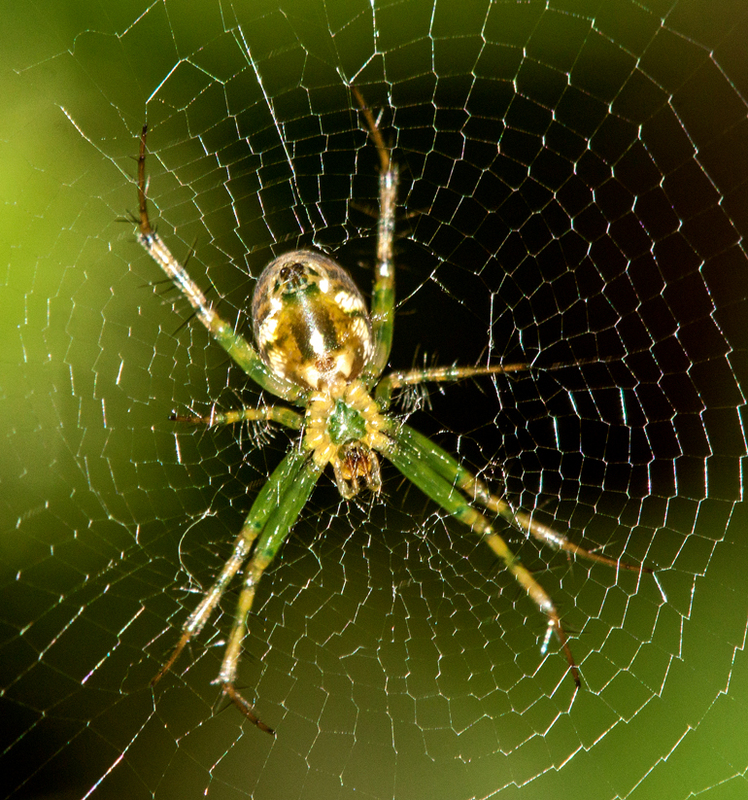 Every since I got my new 180mm macro lens, it seems like the spider population has increased. That’s an exaggeration, of course, but somehow my new lens has caused me to be hypersensitive to spiders and insects within range of the new lens and I find myself filled with an almost irresistible urge to photograph them when I encounter them. I saw this spider alongside a path at my local marshland park and gave in to the urge. As you can probably tell, I used flash to add a little light to the spider. I probably need to diffuse the flash more, so there is not quite as much glare, but I am happy with the way the background turned out—I think the combination of black and green works well with the colors of the spider. 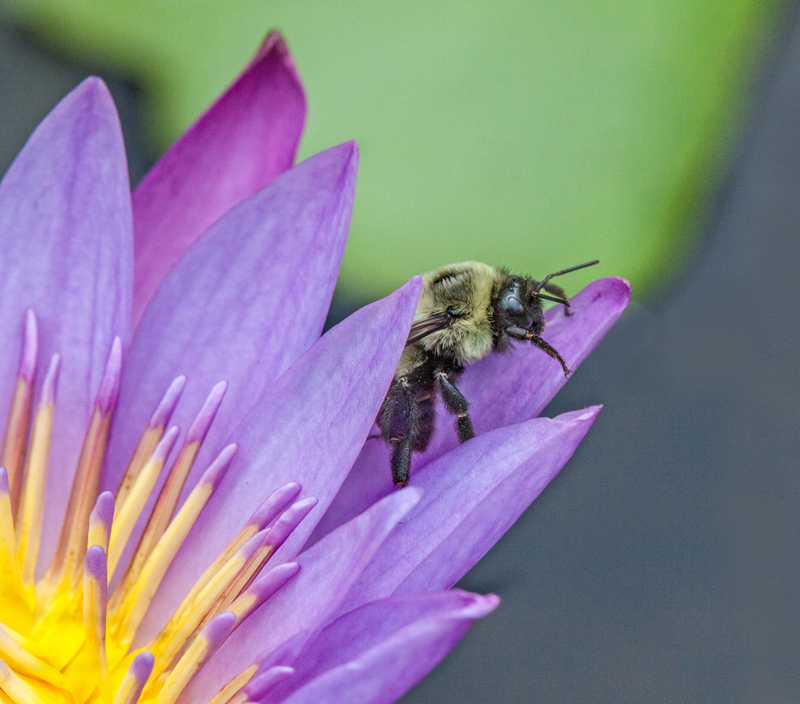 A bee landed on a petal of this purple water lily and, rather than heading for the center of the flower, the obvious source for pollen, decided to crawl down in between the petals. I followed his movements and, after a short time, those movements ceased—I think he was stuck. Eventually the plant began to move again, this time more violently. Slowly the bee reemerged, crawling slowly up the petal, and I took this shot. I find the tones of this image to be very soothing and purple is one of my favorite colors. If you too like purple, check out today’s postings called Violetta at Calee Photography, one of my favorite blogs.